The fall in value of financial assets affected banks’ balance of assets and liabilities, resulting in a fall in overall availability of credit accompanied by an increase in investment in government bonds and a reduction in financing of the private sector. 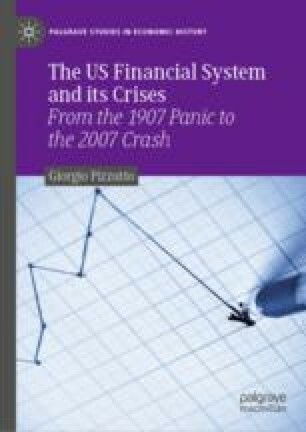 The Great Depression was the final phase in a credit cycle fueled initially by the central bank with an expansionary monetary policy and a reduction in interest rates and risk premiums. The effect of this was sustained growth in the real economy. The more contractionary monetary policy that followed interrupted the process of non-bank financial intermediation and caused a reduction in the value of net assets and availability of credit in the banking and non-bank sectors. New issues of stock and bonds in 1928–1929 served to finance corporations via investment banks that purchased them, initially financing themselves on the money market before reselling them publicly. The increase in interest rates reduced the profitability of this process, leading to a sell-off of financial assets and the collapse of the stock market.